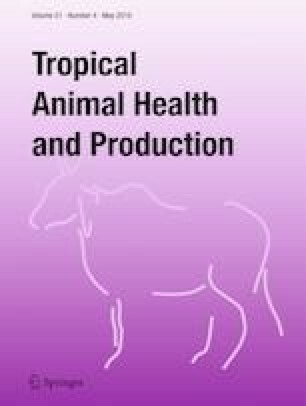 This study estimated the daily nutrient allowances from conventional commercially compounded feed and alternative feeds resources in smallholder pig enterprises in Busia, Nakuru, and Kiambu counties in Kenya. Feeding data from 144 pig enterprises was used to compute the daily dry matter (DM), crude protein (CP), and metabolisable energy (ME) supplied to pigs per kilogram bodyweight. Analysis of variance of the mean values was computed using SPSS statistical software and SAS® systems with Tukey’s test to separate the means. Results showed that the daily nutrient allowance provided by some alternative feed resources was generally very low; however, home-made feed formulations supplied reasonably sufficient dietary energy and CP. Swill was the most popular feed resource in Busia County; however, the amount of energy supplied from swill was very low (ME = 19.98 kcal/kg body weight). The daily CP allowance for pigs fed on swill, farm residue, and market waste was very low ranging between 1.1 and 3.6 g/kg body weight. The findings of this study indicate that there is need for capacity development for farmers with respect to feeding practices that have no capacity to supply sufficient nutrient allowances. Research should focus more improving supply of nutrients from viable alternative feed resources through use of technology. Authors wish to acknowledge the German Academic Exchange Service (DAAD) and the International Centre for Development and Decent Work (ICDD) in Kassel University, Germany, for funding this research, Egerton University through the Department of Animal Sciences for availing facilities for laboratory analysis, officers in the Departments of Livestock Production in Busia, Nakuru, and Kiambu counties and pig farmers for cooperation in data collection. Requisite authority to conduct the study was obtained from National Commission for Science, Technology and Innovation (NACOSTI); which issued a research clearance permit number 15393. Authors state they have no conflicts of interests. FAO. (2012). Pig sector in Kenya; FAO Animal Production and Livestock Country Review No. 3. FAO, Rome. Last accessed on http://www.fao.org/3/a-i2566e.pdf on 4.8.15. INRA, AFZ and Ajinomoto Eurolysine SAS (2008). Evapig: A software tool to predict feed value, version 1.0.0.9; A calculator of energy, amino acid and phosphorus values of ingredients and diets for growing and adult pigs. Accessed from http:/ www.evapig.com on 12th September 2016.